Kirk Cousins gets no respect. 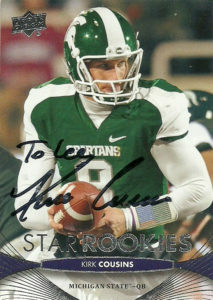 While at Michigan State, Cousins played in 45 games, completing 723 passes for 9131 yards and 66 TDs. He had solid measurables and the stats to back it up as a solid, traditional dropback passer. 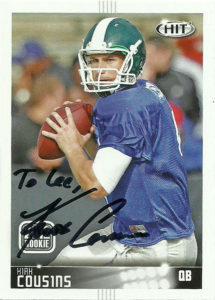 The 2012 Draft is shaping up to be one of the best quarterback crops in recent memory. Among the 11 quarterbacks selected, Andrew Luck and Robert Griffin III went off the board 1 and 2 overall respectively. Next was: Ryan Tannehill at #8, Brandon Weeden at #22, Brock Osweiler at #57, Russell Wilson at #75, Nick Foles at #88, and Kirk Cousins at #102. All of these players saw significant starting playing time or have been named to the Pro Bowl/ AP at their position. The problem with Cousins, was, he was selected by… The Washington Redskins- who had already selected Robert Griffin III at #2 overall. Critics were aghast at why the Redskins selected 2 quarterbacks in the 2014 draft. It turns out that it was a shrewd move by then coach Mike Shanahan. Unlike Griffin, Cousins was afforded the luxury of honing his skills while sitting on the bench. Griffin was thrust into the fire immediately. Kirk saw mainly scrub duty in 3 games while starting only one game his rookie year. He’d finish with a 101.6 QB rating, throwing for 466 yards and 4 TDs. Because of Griffin’s aggressive style of play, (which consequently got him injured,) Cousins saw more starting duty over the next few seasons. Cousins eventually eclipsed Griffin as the starting quarterback entering the 2015 season. During a memorable game against the Buccaneers, Cousins led the Redskins to the largest comeback in franchise history. After the team came back from a 24-0 deficit to win 31-30, Cousins was caught on camera screaming, “YOU LIKE THAT!”, multiple times. It became a rallying cry for the franchise as they pulled off a division title with a 9-7 record. His 69.8 completion percentage led the NFL and his 29 passing TDs rank second as a single season franchise mark. Washington in the meantime opted to kick the can down the road on Cousins, opting neither to trade him or to give him a franchise QB contract. Kirk responded by upping the ante, throwing for almost 5,000 yards- shattering the single season mark he set for the Redskins in the previous year. When he led the Redskins a tie against the Bengals, he addressed his general manager by saying, “How do you like me now?” – an apparent dig at the team for their current growing contract brouhaha. To cap things off after the 2016 season, Kirk was named to his first Pro Bowl. Although teams have again asked the Redskins what price they’d be willing to part from Cousins with, Washington used the franchise tag on him to keep him with the team for the long term. As it became apparent that Kirk was the man in Washington, and he was responding at a decent click, I went ahead took a shot out to the ‘Skins in 2015. Knowing that I might have missed the bus on this one, I didn’t hold out much hope, especially after watching a lot of successes come back. It wasn’t until about 6 months later I got a response from Kirk. Checking responses on sportscollectors.net in early 2017, it looks as though I was lucky and got in on the last group to get him, as the requests are piling up. Much like some other pros, Kirk started off as a great signer TTM, but as the requests pile up, it’s no surprise that he’d have a hard time responding now. Really some great photos here from ‘the big 3’ of college cards. While I liked the photos on both the Upper Deck and the Leaf entries both are plagued by annoying design decisions. The Leaf card is original in its execution, almost audacious in the placement of the Leaf Draft logo in the bottom middle of the frame, but the jaggies on the left and right are distracting from the type. I also am not the biggest fan of the typeface used. The Upper Deck is as usual, full of a lot of bling. The silver is nice and the typeface is grandiose, but it is just too small. His first name, college, and position just basically disappear off the canvas. The silver is nice, and credit should be given to making the STAR ROOKIES label legible in metallic silver. I like the design of the Sage the best. It’s clean and simple and communicates the player’s name efficiently without any frills.